Although stress can come in many forms, both physical and mental, our bodies respond similarly to both stresses by flooding the bloodstream with adrenalin and increasing the need for magnesium to manage the stress. Administering the stress hormone, adrenaline, intravenously causes a decrease in magnesium as well as calcium, potassium, and sodium. Without enough magnesium to relax arteries and muscles, blood pressure rises and the heart muscle cramps. When intravenous adrenaline is stopped, the body recovers in about thirty minutes and potassium rises. However, it takes much longer for magnesium to reach normal levels. There are over a dozen major metabolic processes that are affected by adrenaline, including heart rate, blood pressure, blood vessel constriction, and muscular contraction. Each of these functions requires magnesium and leads to a depletion of this important mineral as the body's response to stress continues. When stress becomes constant in our lives—be it mental, emotional, environmental or physical—the continual fight or flight state of our bodies and cells can create a magnesium deficiency that is detrimental to our health. Without sufficient magnesium, the nerve cells cannot give or receive messages. 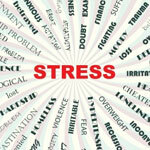 They become excitable and reactive causing a person to become stressed, highly sensitive and nervous. In addition to the adrenal response, the stress response can result in an imbalance of calcium and magnesium at a cellular level. With such an imbalance, calcium triggers the cell into a hyperactive state. This can cause widespread muscle cell contraction and lead to painful cramping. Muscles need magnesium in order to relax. Magnesium supports our adrenals and our immune system that stress, poor diet and lack of sleep can overwork. Magnesium deficiency, which is common in over 75% of Americans, is significant because over 325 enzyme systems in the body require magnesium. The most important ones are responsible for energy production and storage. A strain on the adrenal glands puts a strain on the magnesium-dependent energy system of the body that further promotes stress. The person with a low magnesium level during stress will experience energy depletion that can lead to anxiety and depression, impulsive consumption of junk foods and caffeine and a decreased ability to manage stress. Additionally, due to modern farming methods and food processing procedures – magnesium is largely depleted from our soils and foods making magnesium supplementation an absolute necessity. Under prolonged stressful conditions, the body loses more magnesium than usual through the urine and sweat, adding to magnesium depletion and lowering your stress defenses. Low magnesium/high calcium levels can cause cells and tissues to change physically. High calcium makes bones stiff and hard but in soft tissues it becomes a problem known as “calcification”. This calcification and stiffness in artery and heart cells can hamper proper function and can be a serious factor in heart disease. Calcium that is too high in bones is even a problem; bones need to have some flexibility which is supplied by magnesium. Excess calcium is a very widespread problem. Excess calcium depletes magnesium in the body. Noted authors and researchers, Mildred S. Seelig, MD and Andrea Rosanoff, Ph.D. explain “Calcium is an important essential nutrient, but it must be guarded and controlled, and balanced by adequate magnesium if it is not to cause damage to the cells and the body as a whole.” For these exact reasons excess calcium can become a real problem, while excess magnesium, on the other hand, is not such a concern. Unlike calcium, magnesium does not build up in the body—excess amounts are simply flushed out through the kidneys or bowels. In summary, feelings of nervousness, irritability and being unable to relax may be signs of lack of magnesium. Magnesium is the most important anti-stress mineral and is also known to alleviate depression, anxiety and insomnia. This mineral is something we all need in these tough and stressful economic times. One of the most absorbable forms of nutritional magnesium is magnesium citrate powder that can be taken with hot or cold water and can be found in most natural products stores. A 32-page guide to the benefits of magnesium, along with magnesium deficiency symptoms, written by Dr. Dean is available as a free download at the non-profit Nutritional Magnesium Association www.nutritionalmagnesium.org. Carolyn Dean, MD, ND is a health pioneer with over 30 years of experience inspiring and motivating people to be their healthy best. She’s authored 27 books including "Future Health Now Encyclopedia", "The Complete Natural Guide to Women’s Health, "Hormone Balance", "365 Ways to Boost Your Brain Power: Tips, Exercise, Advice", "The Yeast Connection and Women’s Health", "IBS for Dummies" and, her most popular book, "The Magnesium Miracle". She is the medical director for the non-profit Nutritional Magnesium Association. 1. J Neurosci. 2011 Oct 19;31(42):14871-81. Effects of elevation of brain magnesium on fear conditioning, fear extinction, and synaptic plasticity in the infralimbic prefrontal cortex and lateral amygdala.Abumaria N, Yin B, Zhang L, Li XY, Chen T, Descalzi G, Zhao L, Ahn M, Luo L, Ran C, Zhuo M, Liu G. Source Tsinghua-Peking Center for Life Sciences, School of Medicine, Tsinghua University, 100084 Beijing, China.